Owners Debbie and John Woodward, along with their three sons have operated out of this same location since 1987 - first as a well-loved traditional Christmas Tree Farm, and now with an added vineyard and wine tasting room. Their little piece of paradise is peaceful and beautiful and visitors quickly relax and feel the serenity of their wonderfully treed property before they even sample the wine during their Kamloops winery tour! The wine tasting room has a new (2015) and beautiful patio area for enjoying your wines on sunny days, and step inside and you seem to suddenly enter a whole new world with which to relax further and prepare to tempt your wine palette with two wonderful wines. As this Globe & Mail writer states - "a winery fit for Game of Thrones." As you admire the fine masonry and woodwork, Debbie or John will happily share their story, their passion for what they are doing and their love for making the finest wine possible in small batches with you and/or your group. 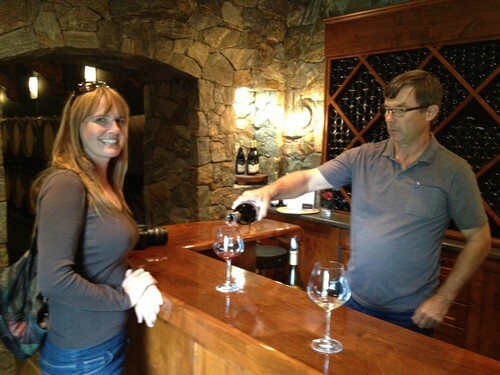 Winery Tours from Sun Peaks are now also available from late spring to early fall. They typically offer 2 or 3 wines, and the first sample, their award winning Chardonnay "exhibits the typical character of this Golden Mile fruit. Hints of stone fruit envelop aromas of citrus and ripe apple, and the subtlety of the French Oak completes the nose. The palate reveals the promise of the nose, delivering ripe citrus and apple, with nuances of peach flavors. There is great structure with this Chardonnay, with a light and slightly creamy youth feel. A wonderfully lingering finish completes the experience". - John Woodward, Winemaker. We couldn't say it better ourselves - and it is a delicious, smooth, buttery oaked Chardonnay in my simple words. Their Pinot Noir on the other hand, has got to be the best B.C. Pinot Noir we have had the pleasure of drinking, and we have been going to the Southern Okanagan Wine Country annually for many years! We first tasted their 2010 Pinot in the summer of 2013 and thankfully bought a case at the time because it quickly sold out. Their wines continue to get even better with each passing harvest, and we generally stop in to enjoy their wines several times each year. The tasting notes are "The PRIVATO 2011 vintage of Pinot Noir was fermented and aged in 100 percent French Oak barriques for 18 months prior to bottling. After lying down in bottle for over one year we are pleased to release this fine vintage. 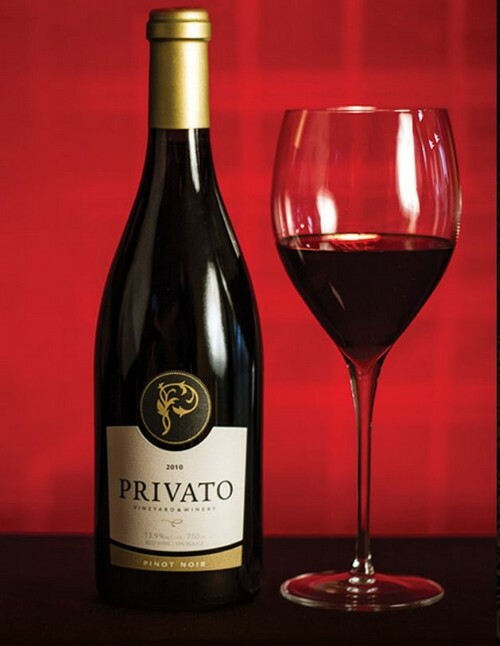 PRIVATO's Pinot Noir has quite a developed style with long aging and significant amounts of red fruit, spice and vegetal notes. The structure leaves a great mouth feel with juicy acidity and silky tannins filling the palate. Flavors of ripe cherries round out the experience, maintaining a mouth-filling balance. The presence on the palate lingers, creating a long enjoyable finish. " Nancy noticed some similarities right away between their Pinot and another favorite of hers - from Foxtrot Vineyards near Naramata in the southern Okanagan. As it turns out, John Woodward was mentored by the Foxtrot father and son duo of Torsten and Gustav Allander, and continues to work closely with the highly respected winemakers. They continue to receive awards for their wines, and during a Pinot Festival in the summer of 2015, famous wine critic Steven Spurrier even gave the Privato Pinot Noir an honorable mention. There is a small $5 tasting fee at Privato Winery, but that is applied against your purchase which is always appreciated. Sign up as a member of their wine club and get exclusive discounts, access to tasting events, and a spot in line for their new releases before they are sold out. We did! Full tours of their beautiful, serene tree farm and vineyard can be arranged by contacting Debbie or John in advance and we believe their is a small fee for that. More details can be found at Privato Vineyard and Winery, or you can complete the form at the bottom of this page. And to get more information about arranging a Kamloops (Thompson Shuswap) or Sun Peaks winery tour service that can pick up groups of between 6-11 people from Sun Peaks Resort (or join up with them in Kamloops) for luxurious Kamloops winery tours, or Accommodation, dining and 'wine-ing' packages, just complete the form at the bottom. And then perhaps on to Harper's Trail Winery - the first official winery in Kamloops, and then Sagewood Winery and Monte Creek Ranch and Winery. The Privato winery is located at 5505 Westsyde Road, Kamloops for those with a GPS. Unfortunately it is across the river from the exit up to Sun Peaks and you have to do a loop around to get over the bridge - but it is worth it. Once you pull in, the friendly vineyard dogs may welcome you, along with the hospitable owners. 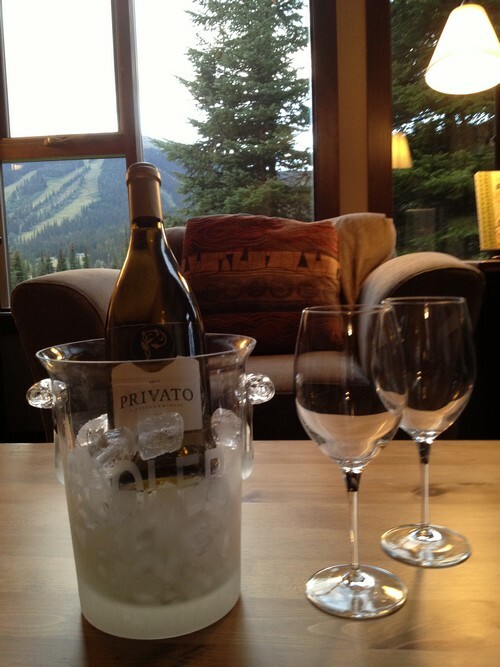 For more information about Privato Winery, or to inquire about booking a spectacular weekend of wine tasting, complete with accommodation at our Best Sun Peaks condo, a private, luxurious escorted tour from Sun Peaks, lunch at a popular Kamloops restaurant and more, complete the form below. Or combine some delicious wines with a Kamloops and Sun Peaks Resort Golf get-away or even various add-on spa packages at Sun Peaks Resort. Their message in the video below is serenity at their private piece of heaven which is an 80 acre farm and vineyard near Kamloops and Sun Peaks (which is our little piece of heaven!). And their wines are simply divine. "Serenity means finding truth in one’s efforts. To toil with passion. And then repose in the delicate splendor of a well-crafted wine. Privato is the yield of years of patience, care and dedication to let you experience your own private heaven."